NYC School of Data – a community conference through #civicdesign, #civictech, & #opendata. Welcome to 2019’s School of Data! Today, we kick off NYC’s Open Data Week and we’re going paperless. Check out today’s attendee notes. Can’t join us in-person, thanks to the Internet Society of New York and Sli.do, you can join us remotely! We are a community driven conference with a focus on open data, civic technology and design conference. As data is the cornerstone of the digital century, we cannot talk about government, society, nor technology without discussing the ramifications of how data is used to manage, maintain, surveil, or legislate. Ultimately, we empower attendants to improve their lives and neighborhoods through workshops, panels, demos, and networking. 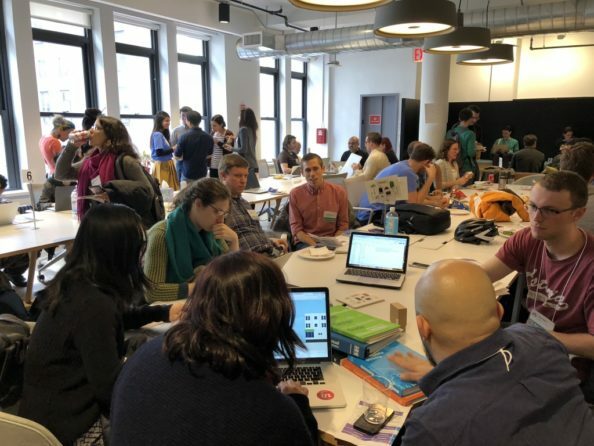 NYC School of Data is organized by BetaNYC and in partnership with NYC’s open data team. Our conference kicks off the City’s open data week. For more information visit NYC’s open data week’s website.